And all this despite Slovakia making amazing strides forward since the fall of communism in 1989 and the split from the Czech Republic in 1993. The economy grew by over 10% in 2007, and in 2009 Slovakia became the first of the former Soviet-block countries to adopt the euro. Slovakia is also a land of amazing natural beauty. Almost half the country is covered in forest. Rolling hills terminate in the alpine High Tatras (Vysoké Tatry). Crystal-clear alpine lakes (plesá) dot the valleys, and are visited by black bears, wolves, foxes, and lynxes. The snow falls melt into rivers that offer great rafting (such as in the Dunajec region). To the south, the earth is hollowed by a huge number of caves, including the rare Damänovská Ice Cave. Hot springs percolate from the ground, providing healing natural waters to the native Slovaks, and the many visitors who make the annual trip to spa towns such as Pieštany, Trenčianske Teplice, or Bešenová. But it’s not this beauty, or the rich cultural heritage that’s on the minds of ordinary Slovaks. Spend few hours in a village, and you’ll realize that “my back hurts” is just as common a greeting as “good afternoon”. While Americans tend to look at the positive in life, we Slovaks seem to think that the cup is always half empty. This is why I find it so amazing to meet Americans who not only do not mind their Slovak heritage, but are actually absolutely proud of this tiny central-European nation. Slovak Cooking has given me the chance to meet many such wonderful Slovak-Americans – by blood and honorary. These are folks with their own unique skills and talents who became unofficial ambassadors of Slovak culture abroad. There is Ben Sorensen, an American music historian and teacher, who fell in love with Slovak music, poetry and language during his stay in the Detva region. Ben learned to speak Slovak, learned to play the fujara, and even married a great Slovak girl. Then there is Margarete Minar, author of Foreigner’s Guide to Slovakia, book providing great amount of practical info for any foreigner contemplating moving to Slovakia. Toni Brendel wrote another great book, Slovak American Touches, which details Ms. Brendel’s quest to rediscover her Slovak cultural heritage. Allan Stevo, an author from Chicago and a frequent visitor to Slovakia, is currently spending a year in Europe and blogging about his observations on 52insk.com. Other Slovak-Americans took to the culinary path to rediscover their heritage. Tonya Harmon writes about her Slovak grandmother and her recipes on Pauline’s Cookbook. Valerian and Katy, a couple in northern California, write about their experiments with Slovak/Czech/Hungarian/American fusion cuisine on Emperor’s Crumbs. And then there is Ms. Helene Cincebeaux. Helene began traveling to Slovakia in 1969, following in the footsteps of her Slovak mom (who just turned 92 this year). She ended up exploring over 2,000 villages and assembled a great collection of traditions, customs, stories and legends. Forty years of research resulted in her new beautifully illustrated book Slovakia! 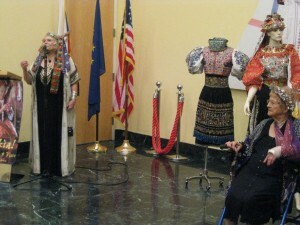 Traditions Old & New, which she recently held a book signing for at the Slovak embassy. I, along with the Washington D.C. Slovak Meetup attended. 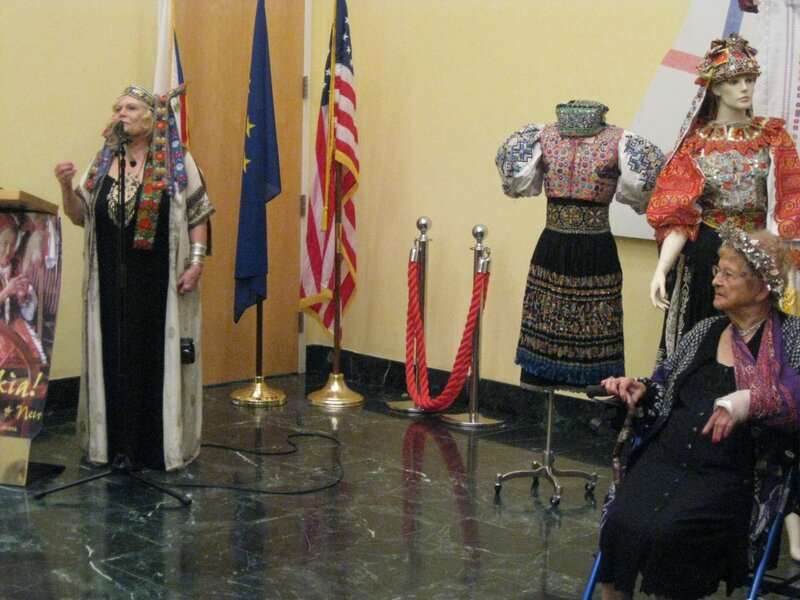 Helene was introduced by Mr. Donald Pafko, the Honorary Slovak Counsel from Minnesota, and Mr. Jozef Ivaška, the man of 1000 songs, provided the musical introduction. The first time I met Helene was in Slovakia, during my two month visit in the winter of 2010. Helene was in Pieštany celebrating her mom’s birthday, and invited me to come. I had no idea who this person was or why she was inviting me! But I went anyway, and learned about Helene’s love for Slovakia, her adopted “homeland”. Some 24 years ago, Helene established the Slovak Heritage & Folklore Society International, which among other things publishes the quarterly Slovakia magazine read by some 1400 families and institutions worldwide. She also created a database of some 29,000 Slovak surnames and villages used for genealogy research. However, Helene’s greatest contribution are her annual Treasures Tours. Through the past 70 tours, she has introduced almost 2,000 people to Slovak culture, traditions, history, and yes, cuisine. Helene and her colleagues lead three tours each year, the first one, titled Immersion in Slovak Art & Crafts, Villages & Castles takes visitors from the spa town of Pieštany through my hometown of Banská Bystrica to the national park Slovak Paradise. The stops include meeting artisans skilled in lace making, egg decoration, wood carving, and floral embroidery. The second tour, the Treasures of Slovakia tour, also visits my hometown on its way to the historical Bardejov. There is also rafting in Pieniny, Detva folk festiva, visit to the Spiš Castle, and a Rusyn village, before heading back to Bratislava and Vienna. Finally, the Magical Byways of Hungary, Slovakia, Poland, Czech Republic and Austria tour takes visitors to five central-European countries, and explores off-the-beaten path treasures such as the Zakopane region in Poland or Strážnice in Czech Moravia. The real treasures of her tours are the snippets of traditional daily lives that she collected along the way. These are all listed on the 170 pages of her new book. Inside, you will learn about New Year’s Eve and Three Kings Day, Fašiangy and Easter celebrations, raising of the May Pole, weddings and village life, coats of arms, name days, folk dances and dresses, Romani parties, Fall harvest and pig slaughter (zabíjačka), advent and All Souls Day, and about Slovak castles and the beautifully decorated wooden homes. 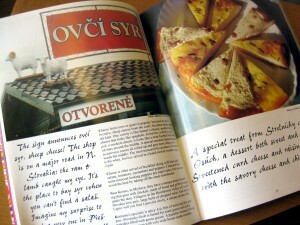 And of course, much info about traditional Slovak cuisine, cooking, and dining. This great new book can be ordered by contacting Helene directly. However, until December 1st you have a chance to win one of two autographed copies Helene donated to slovakcooking.com! All you have to do to enter the sweepstakes is click on the orange banner below and enter your email address. Or if you prefer, you can enter on Facebook by going to http://www.facebook.com/slovakcooking?v=app_28134323652. Just a little correction…Czechoslovakia split in 1993 not 1991. Otherwise completely agree with the interpretation of Slovak/Czech complaining personality. I am from Czech and my grandma is an expert on that. Oops, my bad. Thank you for noticing this (and for your comment). I made the correction above. nice blog, born Slovak now an American, I agree with the fackt that Slovakia is a horrible place to live, where is no democracy and unemploynment is at 14%. Oh ya, you dont want to be sick in Slovakia! Hi Max, don’t know how old you are and what your experiences are. I am 67 years old, left Slovakia when I was 34 years old. I experienced the real life there and in the US, and still go back to experience more as I have family living there. Life is not easy anywhere on a planet of Earth. Life is good in the US but not so easy either. I made the most of it and doing good, better than majority of the US population, but so is my family who is still in Slovakia. Hey, you said “don’t want to be sick in Slovakia”, you know what? It’s no fun to be sick in the US either. Let me tell you, I know all about it, going for a third surgery this year in a couple of weeks, and it’s no fun. Anyway, I am proud of having Slovak heritage, and yes, I think Slovaks complain a lot. Hi Max, thanks for your comment. I left Slovakia when I was 14 so I did not get a chance to experience the real life there – things like getting a job, finding a place to live, etc… Still, I think that one big issue with Slovakia, or Slovaks, is our tendency to look at everything in the negative light. Things are not as bad as everyone makes them appear. By the way, where in Slovakia are you from?